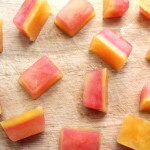 Pour 15ml of apple juice into each of the compartments of the ice cube tray. Put in the freezer until completely frozen. Repeat with the cranberry juice and freeze. Repeat again with the orange juice and freeze.